Use every day if you wish; the emollient gel is very gentle. 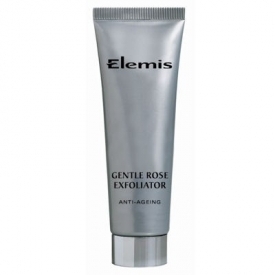 Then, Apply Exfoliator in circular motions all around the face and neck. I found this to be the best facial exfoliator I have ever used. It is very gentle and a pleasure to use. You need only a small amount for the whole face and neck. The texture is very fine but it really does make the skin feel soft after use. Lovely gentle scent. This does not scratch or iritate the skin in any way. I found after several uses my skin looked younger and fresher and my other products seemed to go on better. This is one product I don't want to be without. It is a real must have in my beauty routine. I have used this exfoliator many times and it is one of the gentlest facial exfoliators I have purchased. It has a gel based formula packed with perfectly spherical jojoba beads that gently and effectively removed dead skin cells and resurfaces the skin. This gel has a beautiful and subtle rose fragrance. The gel perfectly cushions the beads to ensure that you never scratch or irritate the skin. I apply this product to a damp face and massage gently. There is a slight warming sensation on my skin and after rinsing away my face feels beautifully soft, smooth and looks radiant. Due to the ingredients your skin feels moisturised after use, not dry or tight.